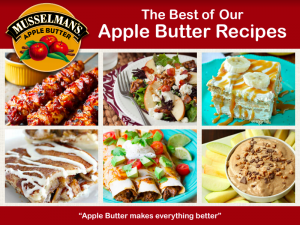 We LOVE Musselman’s Apple Butter so we have teamed up with them to share some of our favorite recipes made with Apple Butter and to announce their NEW E-Recipe Book! Grab Musselman’s E-Recipe Book HERE. You can find two of our favorite recipes in the E-Recipe Book. 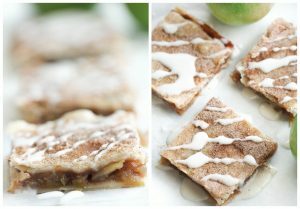 The first one is our Easy Apple Pie Bars! These are so easy to make and have Apple Butter in them, making them better than your usual Apple Pie. Place diced apples in a large mixing bowl. Add Apple Butter, brown sugar and vanilla and mix until well combined and apple’s are evenly coated. Grease of 9×13 pan with non stick spray. Take one pie crust and place it on the bottom of the pan. slowly stretch it out so it covers the bottom of the pan. (I did have to cut some edges off). Add your apple filling on top of the pie crust. Take your second pie crust and roll it out with a rolling pin. Trying to make it the same size of the 9×13 pan. Place your second pie crust on top of the apple filling and tuck down the edges to cover all of the filling. In a small bowl, whisk the egg white until foamy and brush over top of the pie crust. Combine the sugar and cinnamon in another small bowl and sprinkle evenly over pie. Bake in preheated oven for 50-60 minutes until crust is golden brown. Remove from oven and allow to cool for an hour. While cooling, make your glaze by combining all ingredients in a small bowl and whisk until smooth. Drizzle over bars and serve. You can also serve it hot with ice cream on top. The other recipe is our Creamy Caramel Dip. My tip for this one. 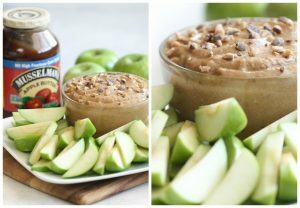 Buy a lot of apples to serve with this dip or you might just take a spoon and it will be gone faster than you think! In a medium bowl, beat cream cheese and brown sugar together until smooth. Add in Musselman’s Apple Butter and caramel sauce and beat until fully incorporated. Add in 1/2 cup powdered sugar and mix well, until dip starts to turn fluffy. Add more powdered sugar until dip reaches desired consistency. Sprinkle toffee bits on top of dip and serve with sliced apples. Keep leftovers in covered container in fridge for up to 3 days. Grab your FREE E-Recipe Book HERE to find these recipes and many others! Do you love Apple Butter as much as we do? Musselmans’ also has 2 other FREE E-Recipe Books. You can find all their books HERE. Check out our other Apple Butter Recipes. These are some of our FAVORITES!